Ottawa has been keeping an eye on Concordia these past years, according to an article by the Toronto Star. Last week, the Star published a document listing all the reports gathered by the Government Operation Centre, an agency that provides emergency response during events of national interest. The list includes protests and occupations from the last eight years, including ones that made national headlines like the Idle No More and Occupy movements. Montreal’s annual anti-police brutality march and the 2012 student protests were also on the list. Surveillance by the Royal Canadian Mounted Police or any national security organization is not surprising, but some people, including the Star, are pointing out the leftist nature of the events subject to police surveillance. Skimming through the list of activities monitored by the GOC, there are recurring themes like aboriginal rights and anti-pipeline demonstrations. “Why are they targeting Indigenous and environmental causes or meetings to organize marches, discussion panels or book launches?” said Larissa Dutil, who organized one of the events on the list. While it’s true that the majority of events listed fall on the left side of the political spectrum, the GOC also kept tabs on pro-life rallies in Ottawa. The federal government likewise collected reports on foreign movements like Arab Spring demonstrations and events closer to Canada, such as a protest in Brazil against a Canadian mining company. According to the document, some reports were collected through media, while others come from government agencies, notably those responsible for aboriginal or foreign affairs, the Canadian Security Intelligence Service and the country’s regional public security offices. As of the summer of 2013, the RCMP also began producing reports on local events, including two events related to Concordia that took place last September. The events are described in the documents only as discussions and stand out among the list of protests, rallies and occupations. On Sept. 13, the RCMP observed a panel discussion organized by the Concordia Co-op Bookstore. The discussion, titled “Colonialism in Quebec: Myths, Misgivings & Nationalism,” was part of a double book launch by Darryl Leroux, an assistant professor at Saint Mary’s University in Halifax, and David Austin, a lecturer at Concordia’s School of Community and Public Affairs. Dutil organized the event with the SCPA. The panel discussion was hosted in one of the school’s classrooms. She estimates about 100 people showed up, a surprisingly high turnout for this type of event, some even standing in the hallway. “It’s hard normally to get people to come to these things,” said Dutil about the number of attendees. The event, like any other, was open to all and publicized on campus, so it’s possible an RCMP officer dressed as a student was in attendance. Why the RCMP would bother attending a book launch is another question. 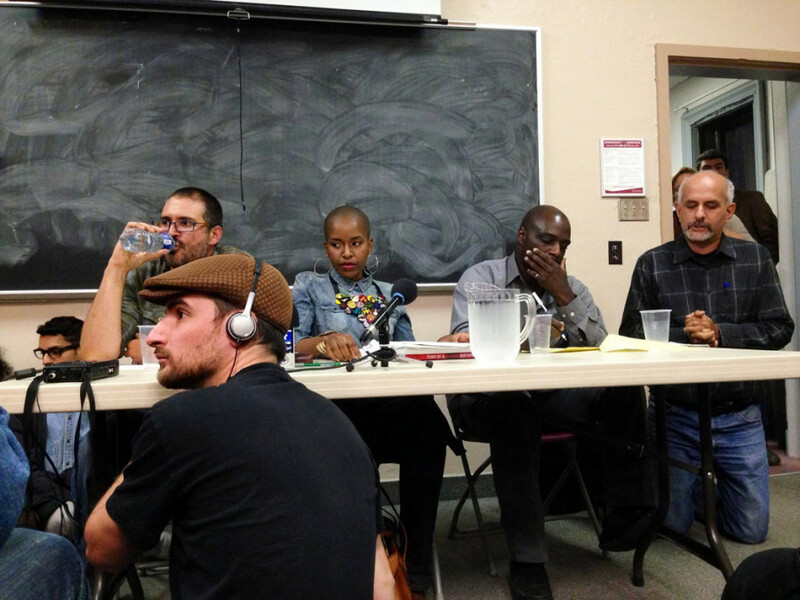 “It was very intellectual, it wasn’t a call to arms or anything like that,” Dutil said of the event featuring the two professors and Délice Mugabo, a black feminist activist. The RCMP’s Quebec office was unable to provide access to the reports or any knowledge of what they were. Sgt. Luc Thibault, the Quebec spokesperson for the RCMP, believes the reports may have been ordered directly by the RCMP in Ottawa, which oversees aboriginal affairs. Thibault isn’t the only one confused. The second event linked to Concordia is described as a discussion on Sept. 20, 2013, sponsored by the Centre for Gender Advocacy and Justice for Missing and Murdered Native Women, but neither of these organizations has any records of sponsoring an event that day.